We have been taking advantage of our fireplace during this cold time of year. Last night we roasted hot dogs over the fire. We had hot dogs w/buns, and baked beans for dinner. 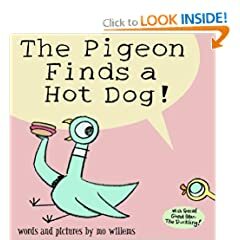 Then we read The Pigeon Finds a Hot Dog. This is one of Emily’s favorite books, and we enjoy the other Pigeon books as well.